At the university town of Évora, I encountered an instrument largely untouched since its installation, c. 1562 by Heitor Lobo. Pasquale Caetano Oldovini added the fashionable horizontal trumpet in 1772 and Flentrop did a restoration in 1967. 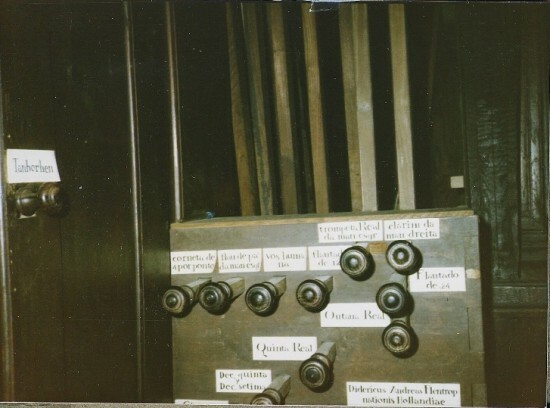 This is one of the oldest extant playable organs in the world. 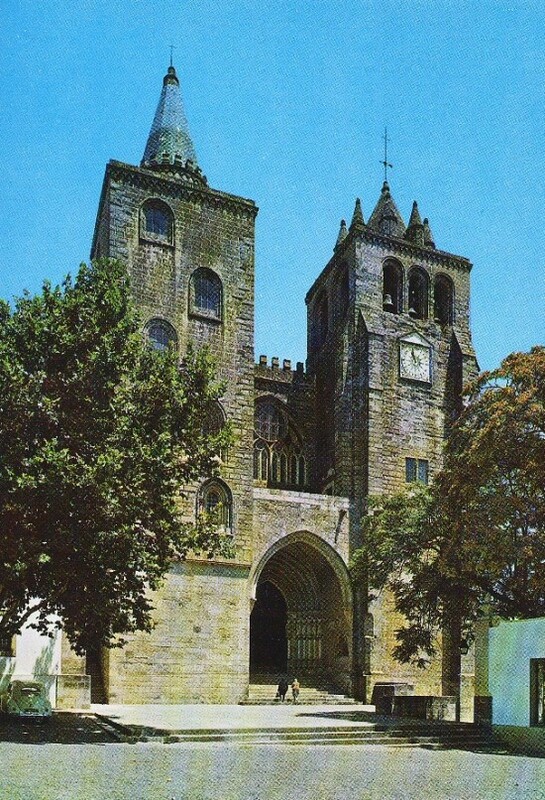 The Sé (or cathedral) of Evora, Portugal, built between 1280 and 1340. 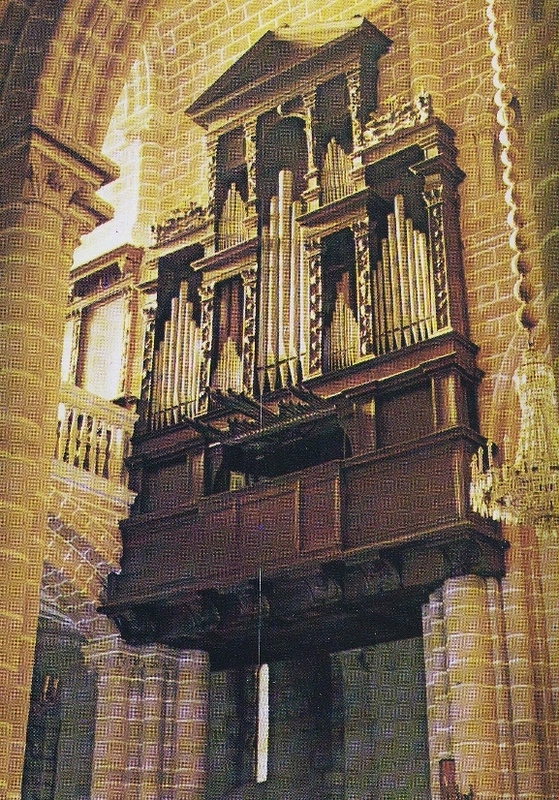 The Great Organ, attributed to Heitor Lobo, c. 1562. Horizontal Trumpet by Pasquale Caetano Oldovini in 1772. Restoration by Flentrop Orgelbouw in 1967. 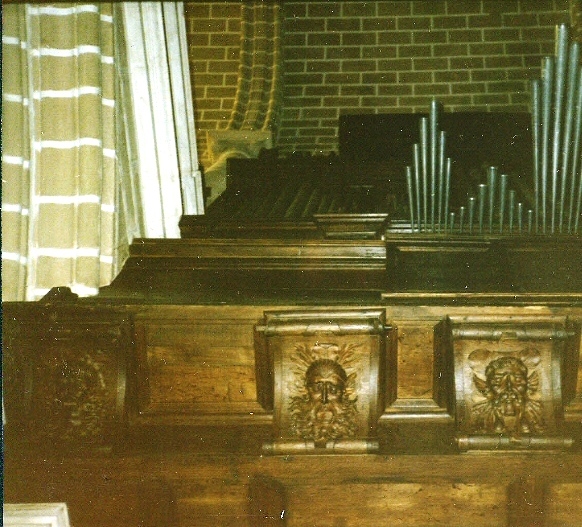 This organ was one of a pair of instruments facing each other as was the style. When Napoleon’s troops marched through Portugal (and the rest of Europe) and needed lead for their bullets, they routinely went into the churches taking apart the organs, melting the pipes into bullets. Luckily the one on this side survived. 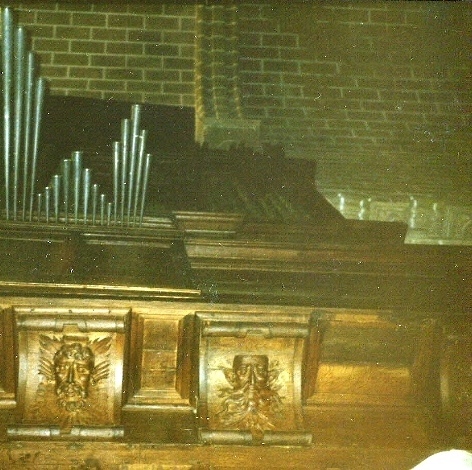 This is a composite shot from underneath the Great Organ case showing the mask carvings and horizontal trumpets, looking up from the floor. 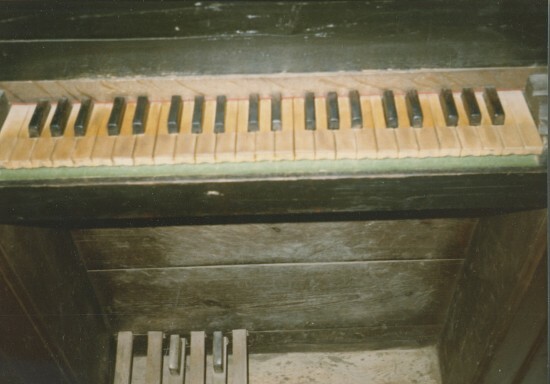 There is one manual of 45 keys with a short octave from C-c³. The keyboard divides between Middle C and Middle C#. 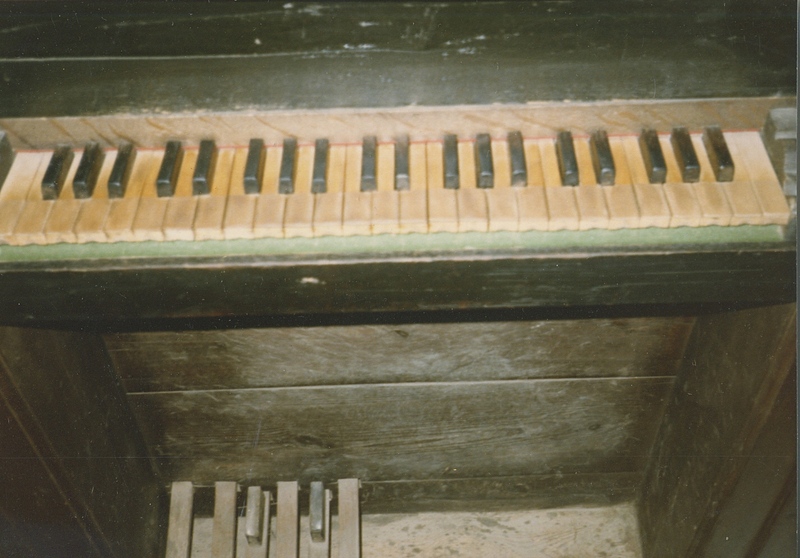 The short octave is permanently coupled to the pedals, playing sequentially “C” (on what looks to be an “E”), F, D, G, A. Consequently, because the compass is attenuated at both the top and bottom, one has to re-write those passages in the program that go too high or low. I knew this going in; all touring organists prepare for it. As if the helter-skelter arrangment of the stops weren’t bad enough, these knobs operate in reverse: to activate the stop you have to push it in; to retire it you must pull it out. With enough familiarity on the organ, this would not be a problem. But I arrived the day before to give a professional level concert. And with everything else going against me, i.e. : the short octave, small compass, stop knobs in no apparent order AND this unexpected reverse business, most of my energy went into remembering whether to push or pull. 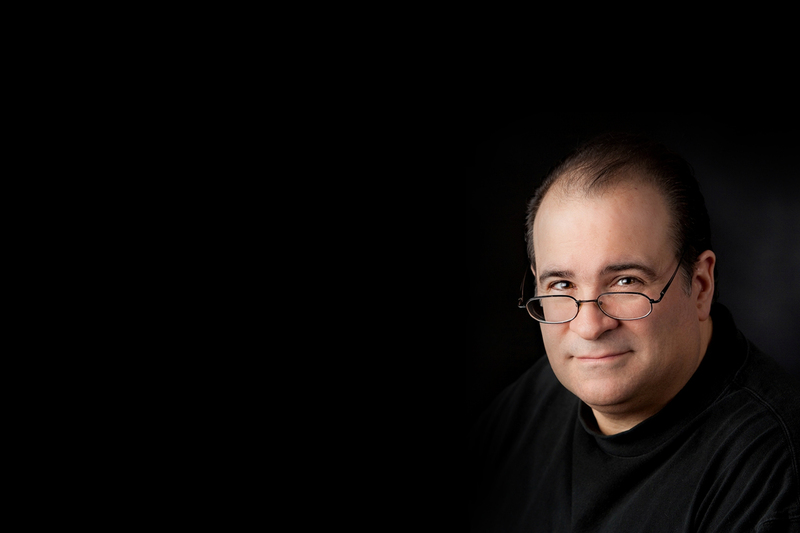 There can be no question about knowing the music cold, for this is a pretty serious obstacle to handle while one is also trying to expressively interpret the music. I read every article in English about this organ before I left the States and it was never once mentioned. You’re welcome! 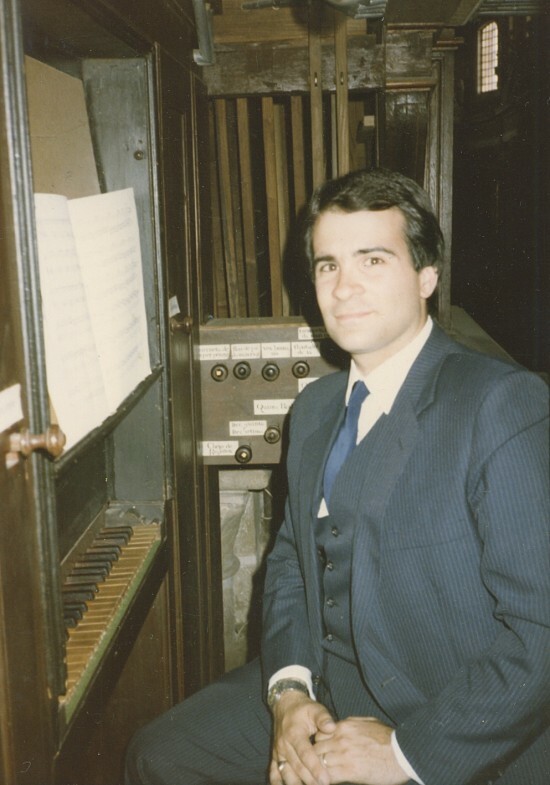 As I said earlier, I believe this instrument is one of the oldest surviving playable organs with its original pipes. 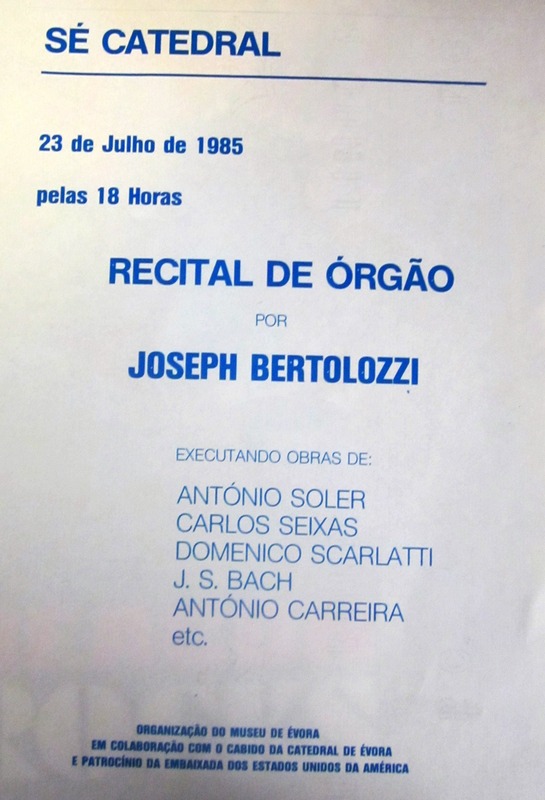 So let’s enjoy some music registered solely on the oldest pipes for the oldest piece on my program: Tento a Quatro em Fa by António Carreira (1525-1589). Gentle, soft-spoken and contemporaneous with the organ itself, it comes to us from across the ages. © 2015 Blue Wings Press. All rights reserved.